films which have been improved with both audio and video noise reduction. (Jul 22, 2010) Former WTA #8 (and doubles #1) Anna Kournikova got a good start in World Team Tennis play this Summer, but ended with losses. Anna and her St. Louis Aces teammate Lindsay Davenport defeated Marie Eve Pelletier and Julie Ditty of the Newport Beach Breakers 5-3 in doubles in St. Louis on July 17, as the Aces defeated the Breakers 21-15 overall. On the road (and Davenportless) the Aces did not do so well. Facing the Boston Lobsters on July 19, Anna and Liga Dekmeijere were defeated at doubles by Raquel Kops-Jones & Coco Vandeweghe, 5-1, and, in mixed doubles, Anna and Tripp Phillips lost to Raquel and Eric Butorac by the same score. Boston defeated St. Louis 25-13 overall. (Jul 1, 2010) On Thursday in London, England, in the Ladies' Invitation Doubles of The Championships at Wimbledon, Martina Hingis and Anna Kournikova defeated Helena Sukova and Andrea Temesvari 6-1, 6-4. Martina and Anna will play Tracy Austin and Kathy Rinaldi-Stunkel on Saturday. (Jun 29, 2010) On Tuesday in London, England, in the Ladies' Invitation Doubles of The Championships at Wimbledon, Martina Hingis and Anna Kournikova defeated Ann Hobbs and Samantha Smith 6-2, 6-4. They will play their second match on Thursday. When asked if she and Martina could return as a main draw doubles team on the WTA Tour, Anna said: "No, not me. [Martina] could be [competitive]. Me, there's no way... For me it would be impossible really physically to be on the tour. It even bothers me a little bit playing like today. I mean, it wasn't strenuous match. It was quite fun and giggly. I'm sure I'm going to feel it tomorrow and I'll be sore. Even to prepare for the specific tournament, the last two months, I've had to have therapy, like real therapy, every day for an hour, hour and a half. "This is just for kind of the fun matches. I would have to live in the trainer's room for three hours every day. I have five different things wrong with my back from two herniated discs to four cracks that I have. The right side is smaller than the left side." About the idea returning to WTA play in general, Martina said: "I did it. I had my comeback. I was very happy with it. I lived through all the emotions. I missed it when I was away for three years. That's why I did the comeback. (June 7, 2010) Anna Kournikova is 29 today. Happy birthday, Anna. Anna's recent activities, in addition to playing in the upcoming Wimbledon Legends doubles competition partnered with Martina Hingis (see below), included auctioning off a tennis lesson, with proceeds going to Boys & Girls Clubs of America. Anna will also be playing in the Cancer Treatment Centers of America Tennis Championships, October 20-24, in Surprise, Arizona. Other players at the event will include John McEnroe, Michael Chang, and Jim Courier. (May 6, 2010) Former WTA doubles #1 Anna Kournikova will play in the Ladies Invitational "Legends" doubles at Wimbledon this year, partnered with her friend Martina Hingis. Anna won 16 doubles titles during her WTA career, 6 of those teamed with Martina, including the 1999 and 2002 Australian Open titles. Anna before receiving the Boys & Girls Clubs' Champion of Youth award last year (June 21, 2009 revised July 8) Former WTA singles # 8 (and doubles # 1) Anna Kournikova cannot play World Team Tennis again this year for the St. Louis Aces due to a left wrist injury. It was to be Anna's second season playing for St. Louis, and her seventh year of WTT competition. Anna's teammates with St. Louis include Kim Clijsters (who is returning to WTA play this summer), Olga Govortsova, and Liga Dekmeijere. (July 24, 2008) On Wednesday in Washington, DC, the World Team Tennis Washington Kastles defeated visiting Anna Kournikova and St. Louis Aces, 22-17. Anna split her sets in her last WTT action for 2008. In women's doubles, Anna & Jasmin Woehr of St. Louis, defeated Mashona Washington & Sacha Jones of the Kastles 5-3. (July 23, 2008) On Tuesday in Albany, the World Team Tennis New York Buzz defeated visiting Anna Kournikova and St. Louis Aces, 25-13. (July 19, 2008) On Friday in Missouri, Anna Kournikova and the World Team Tennis St. Louis Aces defeated the visiting Springfield Lasers 24-23 before a sellout crowd at the Dwight Davis Tennis Center. Anna won both of her matches (WD & XD), putting 64% of her 1st serves in the box with just 1 double fault, and converting 5 of 10 break point opportunities. In women's doubles, Anna & Jasmin Woehr of St. Louis defeated the Lasers Shenay Perry and Chanelle Scheepers, 5-3. And in mixed doubles, Anna & Travis Rettenmaier defeated Shenay Perry and Todd Perry, 5-4. 1. The Early Years, 2. Pro Career, and 3. Anna Offcourt. Prior to 2001, Anna Kournikova's career was hampered by a number of injuries (as happens to many WTA players), including a right foot stress fracture and torn ligaments in her left ankle and right thumb. Anna was at a career-high rank of # 8 in early 2001 when she incurred a left foot stress fracture, which kept her out of play for most of the year. Anna finished 2001 ranked # 74, and in 2002 struggled to regain her previous postion. In September, 2002 Anna tore a left ankle ligament again, and finished the year ranked # 35. Anna started 2003 with high hopes, but suffered from chronic back pain and associated injuries. The last WTA match in which Anna played was at the Family Circle Cup in April 2003, and since WTA rankings are based on the past 52 weeks, Anna is currently "NR", not ranked, by the WTA. Anna has stated that she wishes to return to WTA Tour play, but so far her chronic lumbar (low back) pain has not improved to the point where she is able to sustain daily play. Anna still plays occasional exhibitions, and some World Team Tennis matches (in July each year). On January 25th, 2002, Anna and Martina Hingis won the doubles championship at the Australian Open (interview text Real Video). The kournikova.quickfound.net AnnaK record pages have over 100 photos of Anna in action, from the specific tourneys. Anna volleying a forehand in the XD set (July 17, 2008) On Wednesday in California, at Breakers Stadium, Newport Beach Country Club, the World Team Tennis Newport Beach Breakers defeated the visiting St. Louis Aces and Anna Kournikova, 23-14. In women's doubles, the Breakers Michaela Pastikova & Lilia Osterloh defeated Anna & Jasmin Woehr of St. Louis 5-1. And in mixed doubles, Lilia & Kaes Van't Hof defeated Anna & Travis Rettenmaier, 5-3. Anna's flight had been delayed, and she did not arrive in California until 2am (pre-match interview). And Wednesday was her first chance to practice with her teammates. Anna and the Aces will host the Springfield Lasers in St. Louis on Friday night. (Apr 23, 2008) Anna Kournikova has added a fourth date to her World Team Tennis schedule with the St. Louis Aces. Anna now will play an earlier date for the Aces, in Newport Beach, CA, on July 16. Anna, as previously scheduled, will also play on Friday, July 18, in St. Louis, July 22 in Schenectady, NY, and July 23 in Washington, DC. (Mar 27, 2008) Anna Kournikova attended the "Kickoff Party" at the Sony Ericsson Open in Miami on Wednesday night, March 26, where she could catch up on WTA and Russki gossip with good girls like Maria Sharapova, Anna Chakvetadze, Svetlana Kuznetsova, Nadia Petrova and others. Anna was in Rio de Janeiro for Carnival in February, more recently she opened a new KSwiss store in Santa Monica, CA on March 12. In a recent interview, Anna commented on playing World Team Tennis for a new team this year, the St. Louis Aces. Anna said: "It’s a team tennis thing. Everybody gets traded. I'm quite used to it from all the other sports - NBA, NHL where everybody is traded all the time. It’s no big deal. For me, it’s fun to go play for a new team in a new area. That’s the fun of WTT. It’s really diverse. It brings tennis to towns and cities where there are not big tennis tournaments but there are tons of fans. So it’s great for those fans to see great tennis." Anna in 2007 WTT action (Mar 3, 2008) Former WTA # 8 (and doubles # 1) Anna Kournikova will play World Team Tennis this year for the St. Louis Aces. Anna was traded to St. Louis by the Sacramento Capitals for St. Louis's 1st round pick in this year's WTT draft. Anna will play 3 dates for the Aces: Friday, July 18, in St. Louis, July 22 in Schenectady, NY, and July 23 in Washington, DC. Anna's teammates for St. Louis will include Andy Roddick. Anna in Austin (Nov 12, 2007) The Moscow Times today published a feature article on one of Anna Kournikova's coaches, Larisa Preobrazhenskaya (pronounced pray-oh-brah-ZHEN-skya), who trained Anna at the Spartak Academy in Moscow from age 7 to 9, before Anna moved to Florida to attend the Bollettieri Academy in Bradenton. Anna is quoted as telling a Russian newspaper in 2000 that Larisa "always was and always will be my second mother." Now 78 years old, Larisa, still teaching tennis at Spartak, said that the highlight of her career was training Anna Kournikova. Larisa said: "Annochka had this magic you can't describe. From the first day she walked onto the court, you couldn't take your eyes off her. Her talent and enthusiasm made my job easy, really. We will have champions here at Spartak, but we will never have another Anya." She also said that she considered Anna, who peaked at # 8 in the WTA rankings, never to have fulfilled her potential. Anna was at the new USTA Kids Court at the Horseshoe Bay Resort in Austin, Texas, in early November, and a news video of Anna's visit is available online (photo shown). (Aug 14, 2007) Anna Kournikova played a mixed doubles exhibition last night in Toronto, Canada, the first night of the WTA Rogers Cup (Canadian Open). In the Rogers Cup Tennis Legends exhibition, Anna was partnered with John McEnroe; their opponents were Jim Courier and Carling Bassett-Seguso (the highest-ranked Canadian WTA player of all time). Not surprisingly, the score is nowhere to be found online. Before the match, Anna said: "It's a great opportunity to be back on the court to be in front of fans again, and feel the atmosphere. (Jul 6, 2007) Anna Kournikova and the Sacramento Capitals were defeated, 15-22, by the Springfield Lasers in Sacramento on Thursday night, the opening night of the World Team Tennis season. Anna and Milagros Sequera lost 3-5 at doubles; later in the evening, Anna and Sam Warburg lost the mixed doubles 2-5. Milagros played the women's singles, falling to Tammy Tanasugarn, 2-5. (Jul 3, 2007 revised) The World Team Tennis season begins on Thursday, July 5; Anna Kournikova will be playing for the Sacramento Capitals as they host the Springfield Lasers on Thursday night. Anna's teammates on the Capitals include Anna's friend from Moscow, Elena Likhovtseva, retired former # 1 Lindsay Davenport, Milagros Sequera of Venezuela, 14-year-old Michelle Larcher de Brito from Lisbon, Portugal (the youngest player in WTT history), Mark Knowles and Sam Warburg. Anna on Sunday (Jun 7, 2007) Anna Kournikova is 26 years old today. Happy birthday, Anna. On Sunday, June 3, Anna attended the 2007 Cedars-Sinai Sports Spectacular charity dinner in Los Angeles, California (photo shown). (Apr 23, 2007) Anna's new K-Swiss TV commericial can be seen online at the AdWeek website. Unfortunately, it shows far more of two dwufuses running around than it does of Anna. Anna is scheduled to play in a mixed doubles exhibition in Toronto, Canada, on August 13 to open this year's Roger's Cup (Canadian Open). Anna's opponent will be Canadian player Carling Bassett-Seguso, and their partners will be a couple of other dwufuses named John McEnroe and Jim Courier. (Mar 27, 2007) The World Team Tennis player draft was held on Tuesday in Miami; the Sacramento Capitals had already protected Anna Kournikova as a "marquee player," so Anna will play for Sacramento again this year. On Tuesday, the Capitals chose to keep Anna's friend Elena Likhovtseva on the team; Elena, from Moscow, was a Capital last year, and Anna has played doubles with her on the WTA Tour. The Capitals also selected 14-year-old Michelle Larcher de Brito from Lisbon, Portugal, who is currently a standout at the Bollettieri Academy in Bradenton, Florida, where Anna was trained. Michelle will be the youngest player in WTT history. Mark Knowles and Sam Warburg will round out the Capitals roster. The 2007 WTT season, which includes 77 events in 11 cities, will run from July 5th to July 25th. WTT Championship weekend, July 27-29, will be held this year at the Capitals venue in Roseville, Calif.
press release photo (Feb 22, 2007) Anna Kournikova has signed a contract with K-Swiss to promote that company's tennis shoes and apparel. Anna will appear in two K-Swiss television commercials, the first beginning in March. Anna will also make personal appearances for the brand and wear K-Swiss for all of her World Team Tennis and charity tennis appearances. K-Swiss has been making tennis shoes since 1966. Anna said: "I'm looking forward to working with K-Swiss, and am proud to be involved with a classic tennis brand, known for its performance, elegance and style." (Jan 19, 2007) Anna Kournikova is playing charity tennis exhibitions this winter on the Ace of Hearts Tennis Tour, along with Jana Novotna, John McEnroe, Jim Courier, and others. Anna will play at the Van Andel Arena in Grand Rapids, Michigan, on February 13. The event will raise money for the Miracle Match Foundation to battle leukemia. (Nov 19, 2006) Anna Kournikova has been active in the tennis exhibition "season" this month. Anna also played in a benefit on November 18 in Frisco, Texas, benefiting the Maureen Connolly Brinker Tennis Foundation. That event, which included retired WTA star Jana Novotna, produced photos, but no story. (Oct 8, 2006) Anna Kournikova was in Las Vegas on Sunday for the 11th annual Andre Agassi Charitable Foundation's Grand Slam benefit concert at the MGM Grand Garden Arena. There has been very little press about Anna recently, but she is still looking very nice. (August 3, 2006) A Reuters story today says that Martina Hingis, at the Acura Classic in San Diego, "revealed" that Anna Kournikova had "offered to reprise their doubles partnership that won the 2002 Australian Open title." But the story was not picked up by the AP or AFP, only Reuters carried it. And it did not say when Anna made the suggestion to Martina, or when Anna was considering returning to WTA play. Martina cautioned that it would require much hard work for Anna to play on the WTA Tour again, which of course Anna knows very well; she has never been afraid of putting in long hours of training. (July 17, 2006) Anna Kournikova and the World Team Tennis Sacramento Capitals were defeated 20-18 by the St. Louis Aces at St. Louis, MO, on Monday night. One thing noticable about World Team Tennis, as is the case in many sports, is a strong tendency for the home team to win. All four of Anna's WTT appearances have thus far been on the road, where the opposing teams are very glad to have Anna to draw fans. Hopefully home court advantage will prevail on Anna's final night of 2006 WTT play, Wednesday, July 19, when the Capitals host the Springfield Lasers at Sacramento, CA. (July 10, 2006) Anna Kournikova and the World Team Tennis Sacramento Capitals were defeated by the Boston Lobsters 24-18 at Harvard University on Sunday night. (July 9, 2006) Anna Kournikova and the WTT Sacramento Capitals defeated the New York Sportimes 19-18 at Mamaroneck, New York, on Saturday night. (June 21, 2006) Anna Kournikova will begin her 4th season of World Team Tennis in Wilmington, Delaware, on Thursday, July 6, when her Sacramento Capitals face the Delaware Smash. Anna's teammates on the Capitals' roster include her old friend Elena Likhovtseva, Nicole Vaidisova, Anastasia Pavlyuchenkova, Mark Knowles, Sam Warburg and coach Wayne Bryan. In a press conference call to promote the WTT season, Anna was asked whether the success of her friend Martina Hingis on her return to WTA play this year has made Anna want to return to the Tour. Anna said: "It definitely sparked my curiosity, in that 'Oh, it would be so cool [to return to WTA play]'. But I would only come back if I am 100 percent physically and mentally. "Martina has so much to give; she's an incredible and true talent so I'm very happy for her. "I have a chronic spinal lumbar dysfunction. If I exercise a little too much it does bother me. If I start training for six hours a day on a professional level that's when it's really troubled. If I exercise one or two hours a day it doesn't bother me. "I don't know how to fix that problem right now. If I knew, I would have come back and played already. World Team Tennis is very competitive, but it's a good level for me physically and personally (because it is) a very short amount of time so my back doesn't start to get bad. "It's very hard to say right now [when a comeback could occur]... I'm just kind of taking a break and taking it a day or month at a time. Believe me, if I would know I would already make some sort of announcement or statement. As you can imagine, I get these questions all the time. Really, I want to be honest and I don't want to raise anyone's expectations." (June 7, 2006) Anna Kournikova is 25 years old today; happy birthday Anna! (Apr 6, 2006) Anna Kournikova, Chris Evert, John McEnroe, and Jim Courier played in the third annual Mercedes-Benz Classic charity exhibition at St. Pete Times Forum in Tampa, Florida, on Wedesday night. 8,552 fans bought tickets, with proceeds going to Raymond James Courier's Kids, a charity that assists underprivileged children. in LA on Feb 28, 2006. (Feb 21, 2006) Anna Kournikova played in a charity exhibition doubles match last night in Memphis, TN. Raising money for the St. Jude Children’s Research Hospital, the Le Bonheur Children’s Medical Center and the Katrina Relief Fund, Anna and ATP player Bob Bryan defeated former WTA # 1 Tracy Austin and Bob's brother Mike Bryan, 7-6, 7-6. About the chances of her returning to the WTA Tour, Anna said: "...I would like not to make a retirement announcement. You never know. I would not come back unless I feel 100 percent, whether it's mentally or physically. Anna sending a forehand to Martina (Dec 11, 2005) Anna Kournikova played an exhibition on Saturday in Rio de Janeiro, Brazil, against her friend and former frequent doubles partner, Martina Hingis. Martina is returning to play on the WTA Tour in January, having largely recovered from ankle and foot injuries and pain that forced her to retire in October 2002. During a pre-event press conference, Anna said she has not ruled out a return to WTA play (chronic low back pain has prevented her playing daily tennis), although it is not likely to happen soon. Unfortunately, Anna did not fare well in the exhibition, suffering from a right hand problem. According to a report in the WTA World forum, Anna, who had her hand taped by the trainer late in the 1st set, retired from the match when trailing 1-6, 0-1, because she could not hold her racquet properly due to a rash on her hand (later press reports said the problem was blisters, which seems more likely). (Sep 25, 2005) Anna Kournikova played an exhibition match with 1998 Wimbledon champ Jana Novotna in a charity exhibition in Ottawa on Saturday. John McEnroe and Jim Courier also participated in the event. Jana defeated Anna in their single set, 6-3. Anna said: "I've never been able to play well against [Jana]. I lost three straight times in singles... I don't like her game, too many slices for me [laughing]." (Sep 18, 2005) Anna Kournikova will play doubles with Andy Roddick against Steffi Graf and Andre Agassi in a charity exhibition in December. The Genworth Children's Advantage Classic will be held at the Siegel Center in Richmond, VA. at 7:30pm on Dec. 2. After the doubles (a single 8-game set), Agassi will play Roddick in a 3-set match. Ticket prices will range from $25 to $150. (Aug 27, 2005) Anna Kournikova played exhibitions on Saturday during the US Open Kid's Day at Flushing Meadows. Anna did some hitting with Martina Navratilova (photo shown), and Serena Williams; Kim Clijsters, Roger Federer, Andre Agassi, and Rafael Nadal were among the other participants. (July 14, 2005) Anna Kournikova played her last night of World Team Tennis for 2005 on Wednesday, as her Sacramento Capitals (4-3) were defeated, 24-18, by the Hartford Foxforce (5-1). Anna was playing doubles for the first time partnered with 16-year-old Czech Nicole Vaidisova (who attends the Bollettieri Academy, as Anna did), and they were narrowly defeated by Lisa McShea & Milagros Sequera in a tiebreaker, 5-4(5-4). Venezuelan Milagros Sequera had a big night. She also defeated Nicole at singles in a tiebreaker, 5-4(5-4), and Milagros & Don Johnson defeated Anna & Mark Knowles 5-3 in the mixed doubles. Anna's July 12th matches in Houston (against Steffi Graf) will be shown on ESPN2-TV at 11pm EDT on Saturday, July 16th. (July 13, 2005) Anna Kournikova won at doubles, but lost in mixed doubles on Tuesday night, as her Sacramento Capitals (4-2), defeated the Houston Wranglers and Steffi Graf 21-18 in World Team Tennis play. Anna and her partner Elena Likhovtseva defeated Steffi Graf and Ansley Cargill 5-2. Elena also defeated Steffi at singles in a tiebreaker, 5-4(5-3). In the mixed doubles, Steffi and Mardy Fish defeated Anna and partner Mark Knowles 5-3, which meant the night was not yet finished. WTT rules state that if the trailing team wins the mixed doubles, the contest will continue in "overtime" until the leading team wins 1 game, or the trailing team ties the total game score for the night (in which case a "supertiebreaker" would be played). Anna & her partner won the first game of the overtime, giving the Capitals the 21-18 victory. Tonight, against the Hartford FoxForce at Blue Fox Run Golf Course in Avon, CN, Anna will play her final night of of World Team Tennis this year. (July 11, 2005) On Sunday in Sacramento, Anna Kournikova won in mixed doubles again, but lost again at doubles, as her team, the Sacramento Capitals (3-2), defeated the Philadelphia Freedoms (0-4) 20-14 in World Team Tennis play. Anna and partner Mark Knowles won their mixed doubles set 5-2 over Elena Tatarkova and John-Paul Fruttero. But again, strangely, Anna and partner Elena Likhovtseva, a doubles expert and Anna's partner about a dozen times while on the WTA Tour, were defeated, this time by Tatarkova and Carly Gullickson, 5-0. Anna's next WTT play will be in Houston on Tuesday, July 12, when the Capitals visit the Houston Wranglers and their star attraction, Steffi Graf. (July 8, 2005) Anna Kournikova won in mixed doubles Thursday night, but lost at doubles, as her team, the Sacramento Capitals, was defeated by the Newport Beach Breakers 19-15 in Anna's first night of World Team Tennis play. Anna and partner Mark Knowles won their mixed doubles set 5-3 over Anastassia Rodionova and Ramon Delgado. But Anna and partner Elena Likhovtseva, a doubles expert whom Anna teamed with about a dozen times while on the WTA Tour, were defeated by Rodionova and Katerina Bondarenko, 5-2. story free reg. req. Anna's next WTT play will be in Sacramento on Sunday, July 10, when the Capitals host the Philadelphia Freedoms. (June 24, 2005) In a conference call on Thursday, Anna Kournikova spoke about her upcoming World Team Tennis matches. "I feel good and I've been working out a lot. I definitely haven't decided for sure whether I'm going to stop competing or not on the [WTA] Tour. I haven't announced anything yet. It's still a possibility. I'm realistic. I'm not going to go back if I'm not 100 percent." (June 14, 2005) Anna Kournikova was in Valencia, Spain on Tuesday, helping promote the Emirates Team New Zealand's bid for the 2007 America's Cup yacht racing competition. Team New Zealand is racing in the "Louis Vuitton Acts 4 & 5" starting June 16, prelims for the 32nd America's Cup. Omega Watches, which Anna endorses, are one of the suppliers of Emirates Team New Zealand, so they supplied Anna for the event. (May 29, 2005) Anna Kournikova played a celebrity tennis exhibition at noon on May 28 at Charlotte, NC, against NASCAR drivers Elliott Sadler and Jamie McMurray, and Charlotte Observer columnist Scott Fowler, prior to the CarQuest 300 Busch Series race to be held that evening (photos shown). ...In 2001 I had surgery on my third stress fracture, and the doctors put a 4 mm screw in my fifth metatarsal. I was out for eight months, but by the beginning of 2002 I thought I was back in competitive form. That year my back started hurting—badly. It turned out that I was unconsciously trying to protect my foot, which changed my gait, and that threw my back out of alignment. I struggled for more than a year, working hard and trying to keep up, but the chronic pain kept me from even bending over to tie my shoelaces. In June 2003 I realized I needed a break to get healthy. (May 19, 2005) Anna Kournikova will play a celebrity tennis exhibition at noon on May 28 at Charlotte, NC, against NASCAR drivers Elliott Sadler and Jamie McMurray, prior to the CarQuest 300 Busch Series race to be held that evening. On May 7th, Anna was in New York attending the opening of a the large (29,500 sq ft) new NYC adidas store (photo shown). (Apr 22, 2005) Anna Kournikova is scheduled to play in the "Mercedes-Benz Classic Tennis Exhibition", to be held on May 21,2005 at the Office Depot Center (home of the Florida Panthers NHL team), in the Miami suburb of Sunrise, Florida. The event is also billed as "Legendary Night." Other players in the event will be 3 hall-of-famers: retired Wimbledon champ Jana Novotna, John McEnroe, and Jim Courier. The schedule calls for Anna to play a singles match against Jana, followed by men's singles, followed by mixed doubles. Anna was 0-4 against Jana in WTA play, but they haven't played in 7 years, and Jana is now 36 years old, maybe Anna will get her this time. (Mar 29, 2005) Anna Kournikova was drafted by the World Team Tennis Sacramento Capitals for the WTT's July 2005 season. Former WTA # 1 Steffi Graf was also drafted, and will play one match for the Houston Wranglers. Also selected in the WTT draft on Tuesday were Anna's friend and frequent doubles partner Martina Hingis, who will play WTT for the first time this year with the New York Sportimes, Maria Sharapova (Newport Beach Breakers), Lindsay Davenport (Springfield Lasers), and Martina Navratilova (Boston Lobsters). 12 WTT teams play from July 12-24, then the top 2 teams from the Eastern and Western Conferences advance to the WTT Finals, Sept. 16-17, in Sacramento, Calif.
(Mar 22, 2005) Anna Kournikova and her parents Sergei & Alla have settled their dispute regarding the ownership of Anna's $5 million waterfront home in Miami Beach. Anna's parents filed suit against her in 2004, saying they wanted money for their share of the house they had been living in with Anna. Then Anna filed a countersuit seeking to remove Sergei & Alla's names from the deed. Details of the settlement were not released, but all 3 names reportedly remain on the deed. David Leacock, Sergei & Alla's attorney, said: "Everybody is pleased with the result of the settlement." In her lawsuit, Anna had stated that she paid the entire price for the 7-bedroom, 7-bath, 6,630-square-foot home, and an additional $1 million for improvements. Sadly, the AP report of this "news" states that Anna "has never won a pro tournament" (she won 16 doubles titles with 6 partners including 2 grand slams, plus 2 ITF pro singles titles), and that Anna "has not played competitive tennis for two years" (she has played World Team Tennis, which although not the greatest, is at least "competitive"). (Feb 24, 2005) Anna Kournikova was in court in Miami on Wednesday, where she read from and testified about letters she recieved from stalker William Lepeska. About the explicit letters, Anna said: "My first reaction was disgust. It was beyond my comprehension how you can write these kind of things to a stranger." Lepeska was arrested on January 30 at a home near Anna's on Miami Beach. He had been looking for Anna's house. When she heard this a few days later, Anna said, "I really started to look at the whole world different. It's crazy to think what would happen if he had the right house." (Feb 8, 2005) A stalker was arrested in the area of Anna Kournikova's Miami home on January 30th. The media was alerted today. Anna was alone in her house at the time, but she is OK, and did not even hear of the event until days later. (Feb 1, 2005) Last night, in loose, light-hearted play in the "Serving for Tsunami Relief" exhibition in Houston, Anna Kournikova & John McEnroe defeated Chris Evert & Andy Roddick in a short doubles match, 4-2. In celebrity doubles, Anna teamed with Houston celeb Dr. Phil McGraw to defeat Chrissie & NBA legend Clyde Drexler 6-4. $518,952 was raised on-site and presented in the form of a giant check to former President George H.W. Bush. Highlights from the event can be seen online in a video from Eurosport. (Jan 31, 2005) Anna Kournikova, who is still practicing 5 days a week despite the chronic lumbar pain that keeps her off the WTA Tour, is playing in a charity exhibition at Toyota Center in Houston tonight called "Serving for Tsunami Relief," raising money for those still suffering in south Asia. Anna said: "I'm happy we can all come together and do a little bit to help out." Andy Roddick, Jim Courier, John McEnroe and Chris Evert will also play in the event. About Russian grand slam tourney winners Maria Sharapova, Anastasia Myskina and Svetlana Kuznetsova, Anna said: "I think it's great what they've done. Anastasia is the only one I really know -- she's a sweetheart -- but it's awesome. They're all fighters. They push each other. I'm really happy for them and for Russian tennis. ... I've always been a big supporter of the game. It gave me a life, a way out." (Dec 21, 2004) Last week's report in US Weekly claiming that Anna Kournikova had married singer Enrique Iglesias has now been contradicted by rival People Weekly, who quotes a source as saying: "They definitely did not get married." (Dec 14, 2004) US Weekly has reported that Anna Kournikova (who has been off the WTA Tour for a year and a half due to chronic low back pain) married singer Enrique Iglesias on the beach in the Mexican resort of Puerto Vallarta a few weeks ago. The story has not been confirmed. (Nov 22, 2004) Venus Williams defeated Anna Kournikova 6-3, 6-2 last night in a charity exhibition match at Rupp Arena in Lexington, Kentucky. The event was titled "The Lexus Tennis Challenge." After Anna & Venus played singles, Anna teamed up with Venus' sister Serena Williams to defeat Venus and retired WTA player Brenda Schultz-McCarthy in a single set of doubles, 6-3. Anna has not played on the WTA Tour for the past 18 months due to chronic low back pain, although she would like to return. Brenda Schultz-McCarthy was in the WTA singles top 20 from 1994 to 1997. 4,500 fans paid from $20 to $125 to attend the event. (October 12, 2004) Anna Kournikova and Andre Aggasi defeated Tracy Austin and Andy Roddick 5-2 in a charity exhibition mixed doubles match at the WTT All-Star Smash Hits on Monday, Oct. 11. The event was held at the Bren Events Center on the University of California, Irvine campus. Anna and Andre also won pro-celebrity match, defeating Andy Roddick and Elton John in a tiebreaker, 3-2(3). A lunch with Anna was auctioned, raising another $16,000 for the charity. (October 7, 2004) Anna Kournikova has formed a new company called Akseven to oversee her marketing and charity work. The new firm is based in Miami, Florida, and the president is Wendy Revak. Anna has also signed with Lisa Jacobson of United Talent Agency (UTA) to represent her for all marketing, entertainment and endorsement-related ventures. UTA is a major talent agency with clients like Harrison Ford and Mary-Kate and Ashley Olsen. Her current sports agency, Octagon, will continue to represent Anna for all oncourt tennis activities. (August 22, 2004) The WTA has a new search facility for career head-to-head records, and a look at Anna Kournikova's records against all competitors is interesting. No, Anna has never defeated either of the Williams sisters (she has only played Serena once), or Justine Henin-Hardenne (whom she has played twice). But Anna is 3-1 against former # 1 Jennifer Capriati (not counting Anna's exhibition win over Jennifer), and 3-2 against former # 1 Arantxa Sanchez-Vicario. Anna is 4-1 against Patty Schnyder, 3-2 against Anna Smashnova-Pistolesi, 1-0 against both Elena Dementieva and Vera Zvonareva, and 2-0 against Ai Sugiyama, all top-20 players. Anna has also recorded wins over former # 1s Steffi Graf, Monica Seles, Lindsay Davenport (3 times), Kim Clijsters, and her friend Martina Hingis. Anna is only 2-7 against former WTA # 3 Amanda Coetzer. But in 2001, Amanda said: "[Anna] has a solid all-round game. She can do anything. She can come to the net and she can be aggressive from the baseline... I rate her as a potential grand slam singles champion. She has an amazing game." Anna is not "only a model." She can play very well. Hopefully her low back trouble will improve, and she can take to the courts and play well again. (July 13, 2004) Now that Anna Kournikova's 4-night 2004 World Team Tennis stint is complete, search shows that NO photos of Anna at any of her WTT matches were posted on the Internet by the news services. Further, the local papers where she played don't seem to have posted any photos either. This is downright bizarre. Anna did talk a bit to reporters. After her first 2 nights playing for the KC Explorers, Anna was asked about her prospects for returning to WTA play. Anna said: "I miss playing. I want get playing competitively again... I really don't know when I'll return... I'm trying to get healthy, to get back on the court. That's my goal ... to play competitive tennis as soon as I can... My back is not 100 percent. It's a little sore. But it's really hard to tell much after just two [nights of WTT play]." About her compatriot Maria Sharapova's Wimbledon final victory over Serena Williams, Anna said: "[Maria's] win was great for the sport. New faces ... new personalities. She deserved to win. She has always been a prodigy... It wasn't surprising she beat Serena in the final. She was prepared." (July 11, 2004) Anna Kournikova and the World Team Tennis Kansas City Explorers defeated the Philadelphia Freedoms in Kansas City last night 19-17 (WTT team scores are a total of the match scores). Anna and her partner Silvija Talaja lost their women's doubles match 1-5 to Ansley Cargill & Elena Tatarkova. But Anna, partnered with David Macpherson, won 5-2 at mixed doubles over Josh Eagle & Tatarkova. This was Anna's final WTT appearance this year; she didn't have a great week, but those who have been keeping track of Anna know that if she can stay healthy she will play very well. Hopefully her low back trouble is not ailing her after this week's action. (July 10, 2004) Anna Kournikova and her World Team Tennis Kansas City Explorers lost to the Hartford FoxForce in Hartford last night 19-14 (WTT team scores are a total of the match scores). Anna and her partner Silvija Talaja lost their women's doubles match 0-5 to Meghann Shaughnessy & Milagros Sequera. Anna, partnered with David Macpherson, also lost 2-5 at mixed doubles to Shaughnessy & Don Johnson. Anna has just one more night playing for the Explorers, tonight in Kansas City, against the visiting Philadelphia Freedoms. Hopefully she and her partners will have a better night; unfortunately Anna has not been chosen to play singles for the Explorers. (July 9, 2004) Anna Kournikova's World Team Tennis team, the Kansas City Explorers, defeated the New York Buzz in Schenectady last night 19-16. Unfortunately, Anna did not have a good night. Anna and her partner Silvija Talaja lost their women's doubles match 1-5 to Viktoriya Kutuzova & Bryanne Stewart. Anna, partnered with David Macpherson, also lost 3-5 at mixed doubles to Kutuzova & Justin Bower. The Explorers won both singles matches and the men's doubles to pull out the team victory (WTT team scores are a total of the match scores). Anna and the Explorers will next play against the Hartford FoxForce tonight (Friday) in Hartford. (July 8, 2004) Anna Kournikova spoke to reporters about tennis, her back trouble, and Maria Sharapova. About playing tennis, Anna said: "It is something that I love to do, first of all, and something that I still want to do. I always [wonder] what is the next step after this. I will always play tennis only because I love it, never because I have to. I don’t have to do anything really, that is the most important thing... I have been on the tour for a very long time and I have had to deal with a lot of injuries. It is frustrating, but I tell myself that I am an athlete and I have to deal with it. It comes with what I do." About the media comparing Maria Sharapova with her, Anna said: "You guys are going to talk about whatever you want to anyways. It is not like I have any control over it or I pay attention to it. I have been in this situation long enough to learn what to read and what not to read. It is probably worse for the other [Russian] players because they are always being compared to me. I am happy [for Maria Sharapova winning Wimbledon], it is great for the game. I want the game of tennis to be awesome, I want young kids to get involved in it." About the chances of her returning to the WTA Tour, Anna said: "It is hard to say right now. I am probably going to be evaluated after [this week's WTT matches]. The problem with my back is that I can’t play for a very long period of time. If I play for two weeks, four hours a day that is when it really starts to bother me. I can play an hour, an hour and a half every day and it doesn’t bother me. It bothers me if I play four hours a day and that is what I really need to do to play on the tour. We’ll see how it goes, but hopefully I can get back because I really want to play." (July 7, 2004) Anna Kournikova and her partner Silvija Talaja of Croatia won their first World Team Tennis doubles match for the Kansas City Explorers last night against the Sportimes in Mamaroneck, N.Y., defeating Bea Bielik and Ruxandra Dragomir 5-3 (WTT matches are a single set to 5 games). Anna also played mixed doubles, partnered with David Macpherson, but they lost 5-4 (5-2 tiebreak) to Bielik and Hermes Gamonal. The Explorers as a team were defeated by the Sportimes 22-19 (WTT team scores are a total of the match scores, and KC lost 5-1 in men's singles). Anna and the Explorers will next play against the New York Buzz at 6 pm on Thursday, July 8, in Schenectady, N.Y.
(July 5, 2004) Anna Kournikova will be playing World Team Tennis this week for the Kansas City Explorers for the 2nd straight year. Anna's WTT schedule includes matches in New York on July 6th and 8th, in Hartford, Connecticut on July 9, and in Kansas City (hosting Philadelphia) on July 10. Anna's teammates will include Silvija Talaja of Croatia and Australian Rachel McQuillan. Anna has said she would like to play singles this year (she played doubles last year), but no further details are available online at this time. About the match, Anna said: "It was fun... I'm getting my game back to become competitive again." But Anna told reporters that her chronic lumbar injury is still a problem. Anna said: "Every time that I see I'm getting better, it gets worse. I don't want to push it to the limit where I'm not going to be able to move... I'm frustrated because I miss [tennis]." (June 19, 2004) Anna Kournikova spoke to reporters this week about her desire to return to the WTA Tour, and her World Team Tennis matches in July. Anna said: "WTT is a way for me to still play matches. I miss being on the court and I always have so much fun playing. I have a chronic injury with my back. My goal is to become healthy. I'm still playing everyday and working out everyday... Back surgery is very serious and very difficult, so taking medication and doing what my doctors tell me right now is what I'm going to stick with... I'm not surprised about all the injuries that happen... [On the WTA Tour] you play everyday - it's a job 24/7, seven days a week. After a while, your body starts to crack down... I had a great experience in 2003 playing WTT. And I'm excited to play again this year. It's a great format to play and the crowds get so into it. WTT is more relaxed but still very competitive." In last year's WTT season, Anna played doubles with the Kansas City Explorers. This year, she might play singles. Anna said: "It's up to the coach. But I'm getting ready to play singles." (June 7, 2004) Anna Kournikova is 23 years old today. Happy birthday, Anna, and we hope that this year you find a orthopedist, or chiropractor, or rolfer who can get you back on the WTA Tour, where you can shut up the schmucks who think they sell more newspapers by claiming you aren't a good tennis player. (June 1, 2004) Anna Kournikova was in Plymouth, England on May 31st to give the official start of the Transat 2004 transatlantic yacht race at Plymouth Sound. 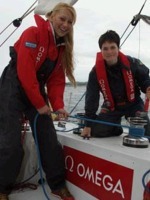 Anna, representing the Omega watch company, an event sponsor, also received sailing lessons on an "Open 50" class racing yacht in the morning from veteran sailor Ellen MacArthur. Anna said: "The sailing today was great. It was rainy and windy but I had a lot of fun with Ellen because she clearly explained how the boat works, and about sailing in general. I really enjoyed it... My experience today has definitely given me inspiration and I can imagine how it's easy to get really interested in the sport of sailing." (Mar 6, 2004) Anna Kournikova made a further statement about how soon she might be able to return to the WTA tour. Speaking to the press in Singapore, Anna said: "I'm training now and I'm going to make an evaluation in two months to see if I can start playing in the middle of summer... We'll see how I feel. I want to come back 100 per cent. Then I can really feel good on the court." (Mar 5, 2004) Globetrotter Anna Kournikova is in Singapore today, launching a new line of Omega watches. It is Anna's first trip to the former British colony, located in Southeast Asia at the tip of the Malay peninsula. Speaking to reporters in Singapore, Anna said: "Right now, my main focus is to get healthy and get back on court, hopefully I will be playing by the end of summer." (Mar 2, 2004) In a Reuters story on the advance of Russian tennis, current WTA # 7 Anastasia Myskina credited Anna Kournikova with attracting investment to improve the Russian women's game. Anastasia said: "[Former Russian President Boris] Yeltsin brought sponsorship and people who wanted to give money to the girls, and Anna changed things a lot as well. She was the one who began all these things." Anastasia, born in Moscow 1 month and 1 day after Anna, received her early training at Moscow's Spartak Academy along with Anna when both were aged in the single digits. (Feb 17, 2004) Although not yet back on the WTA Tour due to her chronic back injury, Anna Kournikova was at The Racquet Club in Memphis, TN yesterday for the Kroger St. Jude tourney. Anna presented a check to St. Jude's Children's Hospital, talked to fans and signed autographs. Last year Anna presented a check for $30,000 to St. Jude's (she had won a skills challenge at the 2002 US Open and designated St. Jude's as her charity). (Feb 10, 2004) Anna Kournikova and Serena Williams (and a few other athletes) will be featured in this year's Sports Illustrated Swimsuit Issue. Some of the pics can be seen online now (click on the link), the hard copy goes on sale tomorrow, Feb 11th. More kind words: Anna has a friend in Russian-born Frenchwoman Tatiana Golovin, who turned 16 while reaching the 4th round of last month's Australian Open, during which her ranking rose about 200 places. In a Paris interview on Feb 8, Tatiana was asked what she thought about being known as the “French Kournikova." Tatiana said: "I think that’s nice. I know Anna very well; she is a very nice girl. She also belonged to the Top 10, which is one of my objectives as well." (Jan 24, 2004) 17-year-old Russian WTA # 48 Dinara Safina had kind words for Anna Kournikova while speaking to reporters at this year's Australian Open. After her 3rd-round loss to # 2 Kim Clijsters, Dinara said: "Women's tennis, in Russia and around the world, is popular because of Kournikova. A lot of players want to be like her. She was in the semifinal of Wimbledon and in the top 10 . . . I think she did a lot for women's tennis." Anna is not in Melbourne this year due to her chronic low back pain, which has kept her off the tour since early last year. Anna does intend to return to WTA play, possibly this spring. (Dec 8, 2003) Retired former WTA singles # 1 Arantxa Sanchez-Vicario of Spain defeated Anna Kournikova 6-3, 4-6, 7-5 yesterday in an exhibition match held in a bullring in León, Spain. 6,200 attended the 1 hour, 44 minute match, although 7,500 tickets were said to have been sold in advance. (Dec 7, 2003) Anna Kournikova arrived in León, Spain, yesterday to play an exhibition against retired former WTA star Arantxa Sanchez-Vicario in a bullring today. 7,500 of the 10,000 seats available were sold in advance; the match should be well over by this writing, but no results are yet available online. Arantxa won 29 WTA singles titles (including 3 French & 1 US Opens) and 67 WTA doubles titles during her career, which began in 1985. Arantxa attained the # 1 ranking in 1995; she retired after the 2002 season. In case you missed it, there is another of the seldom seen "Anna is not so awful" articles online. This one, from late August by Stacey Pressman of ESPN, is titled Don't hate her because she's beautiful. "She's engaging and friendly. She kissed everyone hello and goodbye... She's self-deprecating and funny..."
(Nov 23, 2003) At the Superset Tennis exhibition in Portland, Oregon, on Sunday, Anna Kournikova defeated almost 17-year-old # 226 Carly Gullickson in the afternoon session 6-2, but lost to Carly in the night session 3-6 ("Superset" meaning they play single sets). Anna was to play # 25 Amanda Coetzer of South Africa, but Amanda got stuck in Australia somehow, and Carly filled in. (Nov 9, 2003) Although the score is tough to find, online forums report that Anna Kournikova defeated # 33 Tamarine Tanasugarn of Thailand 2-6, 6-4 (10-6 tiebreak) in an exhibition match in Pattaya, Thailand today. The photo shows that Anna was very happy to be playing. In a post-match press conference, Anna reiterated to reporters that she has no intention of retiring from pro tennis. Anna said: "I still love tennis and want to play, but I have a chronic back condition which makes it impossible to play more than a week at a time. As an athlete you must expect injuries and you have to learn how to deal with it, but it is very frustrating. But I really enjoyed playing against Tammy." Asked about surgery for her back, Anna said: That is one of the options I'm looking at. I hate needles, but I have to look at everything." About suggestions that she would rather be an actress than play tennis, Anna said: "When there is no information about me there will always be rumours. I should hold up a sign. My number one priority is tennis. That's what I want to do, far above anything else." (Nov 7, 2003) Anna Kournikova is in Pattaya, Thailand for a 3 day promotional visit. Although sidelined from the daily grind of the WTA Tour by a chronic low back injury, Anna is able to play the occasional match. So after the Volvo Cup WTA women's singles final in Pattaya on Sunday, Nov. 9, Anna will play local hero # 33 Tammy Tanasugarn of Thailand in an exhibition match. Anna is also taking part in other promotional activities in while in Pattaya. (Nov 1, 2003) Not Retiring! : Anna Kournikova gave a phone interview this week to the Portland Oregonian. Anna said: "They can write what they want. You know they're always trying to get big headlines in London. I'm not retiring. Right now, I have more time to do other things until my back fully recovers. They sensationalized that and the headline said 'Anna's retiring,' but that's not true. I'm just trying to get fully recovered." The interviewer was apparently more interested in sounding cool than in asking Anna useful questions, but at least we have her clear statement that she does not want to stop playing. (Oct 6, 2003) Anna Kournikova's agent Phil de Picciotto told The Observer newspaper last weekend that the chance of Anna's return to WTA tournaments was "undetermined". De Picciotto said: "I wouldn't put odds on it. She's playing some exhibitions later in the year and then she will see more from there... Playing too many days in a row, too many weeks in a row, is a problem. Playing on occasions is not a problem. So the question is, as it would be for any top-level player, can she sustain the rigours of a year-long circuit that basically has no off season?" De Picciotto also stated that Anna is no longer being coached by Harold Solomon, who trained Anna last year and earlier this year. The BBC reports that Anna has a chronic sprain of the lumbar spine (low back). Previous reports called it a chronic strain of the lumbar spine. Either way, the condition which is inoperable, and leads to referred pain in other parts of her body. "remember, before Anna suffered some serious injuries she was a really terrific young player, top 10. But all her jealous critics ever do is remind us that Anna's never won a tournament. It's like part of her name. Anna Kournikova, who's never won a tournament, brushed her teeth this morning." (Aug 3, 2003) The August 2003 issue of Maxim magazine, currently on newsstands, features Anna Kournikova on the cover. There is a short interview of Anna, probably made a number of weeks ago, along with several photos. Anna looks great as always, but the photos are overly airbrushed, and if anyone doesn't need airbrushing, its Anna Kournikova. "My life is really not so exciting as they make it out to be. My life is much more simple. If I were to go out and set straight every single rumor, I would have no time to do anything else." (July 19, 2003) Anna Kournikova won both her matches for the third straight time in her final gig of World Team Tennis last night, playing for the Kansas City Explorers against the St. Louis Aces in Kansas City, Missouri. The WTT order of play varies from evening to evening. Last night Anna's 1st match was the 2nd of the night, where she and women's doubles partner Aniko Kapros of Hungary defeated Nicole Arendt & Brie Rippner, 5-2 (WTT matches consist of a single set). Mixed doubles was the 5th and final match last night, and Anna & Rick Leach defeated Nicole Arendt & John-Laffnie de Jager 5-4(3). The Explorers (now 4-5) as a team defeated the 2-6 Aces 23-19 (totaling the number of games won by each team -- full results -- team standings). Anna did not play singles in her WTT matches, due to her persistent low back injury. Anna has withdrawn from next week's Bank of the West Classic, due to her chronic lumbar spine injury. The announcement at the tourney website went so far as to say that Anna "is not planning to compete in any Tour Tournaments during the summer circuit, including the US Open." This has not been confirmed by other sources, although it is unfortunately a distinct possibility. About her back injury, on Friday Anna said: "Being on the court hasn't changed, but it gets harder and harder to go on with the X-rays and doing rehab. Playing two or three weeks in a row is tough. It's hard to concentrate on the tournament when you're thinking that you might have to pull out." After withdrawing from Wimbledon: "It's been very difficult... As soon as I get healthy, things start to come up. It all comes from the back. It's very hard to maintain a physical level and good condition. As soon as I start to play a lot of matches, it starts to come back. It's hard to keep it in tune... Even if my back is OK, it refers down into my legs. It's been frustrating. As an athlete, I have to take it and try to be at my physical peak and take care of my body. That's my main goal right now. My health is most important." July 13 phone interview from Miami: "I'm not complaining. My life is great. It's been that way. I'm not able to compare it. I'm still a normal person, do all the normal things, the regular human-being things... It's not really surreal. That's my life. It's not as amazing or exciting or surreal as a lot of people make it out. I do a million things every day. I'm real busy, I work and play and do the normal things everybody does, it's just that a lot of time it's in the public eye. Instead of going to an office, I play tennis, I do appearances. "I play tennis... There are people who do movies. Me, going to practice, that's my thing. ... That's my main priority. That's the thing I know how to do." July 17 in St. Louis: "I know I’ve been good in the past. As an athlete I put pressure on myself, but not because of what anyone else thinks... I’m really glad to be out here. It’s a great opportunity to play a match and be in front of a crowd. I miss it, being on the court. I love it." (July 15, 2003) Anna Kournikova's agent Phil de Picciotto (of Octagon) has stated that Anna is still struggling with an inoperable chronic sprain of the lumbar spine, which she incurred at the Australian Open last January. Anna still intends to play World Team Tennis this week, but the Reuters story implied that she may play only the doubles events. De Picciotto said: "Anna is unable to play a consistent tour schedule with her back the way it is now. And unless there is a marked improvement, her schedule will remain uncertain... After this week, she'll know a lot better how she feels... She won't play the Canadian Open in Toronto [Aug. 11] but, if she's feeling better, may ask for a wild card into New Haven [the Pilot Pen Open], which starts the week before the US Open." (June 9, 2003) Anna Kournikova has withdrawn from the DFS Classic in Birmingham this week and the Hastings Direct International Championships in Eastbourne next week after aggravating a chronic lumbar (back) injury while practicing. This is the same back problem that has troubled her since January. Anna was visibly very upset (in tears) in the clubhouse after the injury occurred during a 45 minuted practice session with her coach Harold Solomon. Anna remains entered at Wimbledon. Anna said: "I'm very disappointed, actually devastated not to be able to play in Birmingham... Grass is my favorite surface and I love playing in England. So having to pull out because of my back is the last thing I wanted... I've been advised not to play this week or next week and I don't know any further than that... They said my injury was chronic because it keeps coming back. It's the same problems I've had since the Australian Open and it gives me referred pain in other areas. But it all comes from my back." (Apr. 12, 2003) Not exactly news: Ashley Harkleroad, after defeating Meghann Shaughnessy at the Family Circle Cup, was asked how she felt about being compared to Anna Kournikova. Ashley said: "You know, I've been practicing with her a lot in Miami, and she's a very sweet girl, and we get along well, and she's a very cool girl. So I just take it as a compliment."